SMARTsat High performance SpO2 technology enables accurate and reliable monitoring of all patients, from neonates to paediatrics to adults. 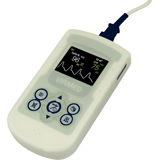 The ergonomic VM-2160 hand held pulse oximeter has the durability of a compact and lightweight hand held unit for spot checking of SpO2, but also has the power and functionality of a stand alone pulse oximeter. The very latest and innovative signal processing technologies and algorithms enable precise measurements, even under very difficult physiological conditions.